Inspired from the famous "Tentures des Indes", the Oasis - Vertical tapestry is based on a set of 8 tapestries woven at the Gobelins during the 17th century. Originally designed by Albert Echhout, these works show the artwork inspired by explorers returning from exotic lands. The fascination with the Orient was evident in European art, and here we see palms bearing coconuts, and a peach tree with a Pecan, among a rich oasis in the desert. Ducks are seen paddling in the river in the foreground. Full of fascinating composition, this art work is a work showing the European fascination with Oriental flora and fauna. 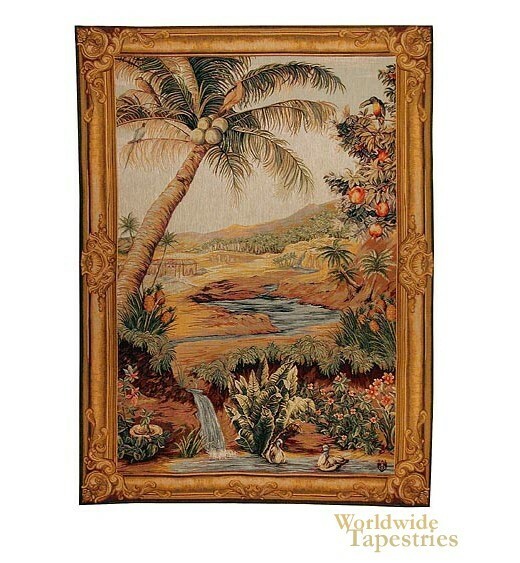 This Oasis - Vertical tapestry is backed with lining and tunnel for easy hanging.